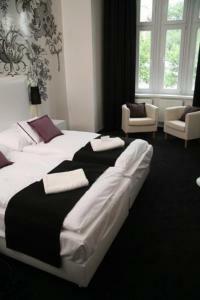 The renovated, stylish My Hotel Apollon in Prague's Zizkov district is a 15-minute tram ride from the centre. It offers air-conditioned rooms with free W-Fi and plasma TVs. The rooms are spacious and some of them even feature a balcony. A rich buffet breakfast is available in the morning. Close-by there is the green Vitkov Hill, which is one of Prague's largest parks. The Vozovna Zizkov stop for day and night trams is located right opposite the My Hotel Apollon.